Is a HUB for information and a CATALYST for the integration of mindfulness into education as a means to overall well-being for students, educators, families and society. These audio files consist of various lengths of silence as an aid to meditation practice. A bell is rung once at the start and three times at the end. You may download these files or listen to them in streaming audio. We've put together a list of resources as a starting point for those interested in exploring Mindfulness further. 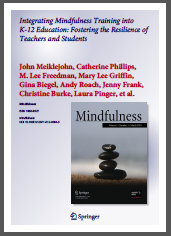 A recently-published white paper points to the benefits of providing mindfulness training to educators and provides recommendations for further research and implementation. Entitled Integrating Mindfulness Training into K-12 Education: Fostering the Resilience of Teachers and Students the paperwas published online March 2012 by Springer Science+Business Media. Read an interview transcript with lead author John Meiklejohn, LICSW.